One of the biggest secrets of great grilling is in the meat selection. This is particularly important when it comes to lamb. Knowing what you are getting is vital to getting the meat you want. While lamb might not be one of the meats think about grilling, no other meat benefits more from the fire like lamb. Tradition has dictated that spring is the time for lamb. Young lamb used to be brought to market in April and May to be bought up and savored for its juicy, delicate flavor. Nowadays, thanks to controlled breeding young lamb can be had year round. However, you might find a narrow selection of lamb products at the local supermarket so you might need to drop by a specialty shop or meat market. Sheep are slaughtered at a wide variety of ages. Lamb refers to young sheep aging from one week to about eight months. Hothouse lamb is one to two weeks old. Baby lamb is four to six weeks old. Regular lamb (what you get at the supermarket) is six weeks to one year in age. After this, it is referred to as mutton or yearling lamb. With increasing standardization in the meat packing industry, what you will generally find is that lamb on the market is not as young as it used to be. The typical lamb will weigh in at 32 lbs. and mutton at 50 lbs. The reason for the preference of lamb is that as a sheep ages the meat becomes tougher and stronger in flavor. Most people don't like the strong, gamy flavor. So How Do You Tell What You're Getting? As sheep age, the meat becomes darker. Hothouse lamb has pink flesh, white fat and red streaks through the bones. Mutton has a dark, almost purple flesh, yellow fat and white bones. And, of course, another way to tell is by size. The smaller the cut the younger the lamb. The younger the lamb the milder the flavor and the more tender the meat. So, What Do You Do With Lamb/Mutton? Why you grill it of course. The best cuts to go for are the loin, leg, rump, and ribs. You can grill up these cuts just as you would pork or beef, but you will get something extra, namely a tough, strong flavor meal. The secret of cooking lamb and mutton is in the tenderizing and marinating. This secret goes back to the earliest days on sheep eating. The oldest methods of preparing lamb or mutton (lamb was very rare in the old days because of the built-in waste) involve stews and shredding. Mutton stew was a popular meal among the rural sheep raising peoples. The stew would be cooked for a very long time to tenderize the meat and reduce the flavor. Other lamb greats are Moussaka (ground lamb layered with vegetables) and Badshahi Gosht (mutton curry, boy you haven't lived until you've had a good mutton curry). All Fine and Dandy, but What About the Grill? To cook up a tender piece of lamb or mutton you need to first tenderize and marinade. Depending on what cut you're using, take the meat and pound it well with a meat tenderizer. This will help break down the meat density, allowing it to cook more evenly and allowing the fats and tendons to break down more. Then apply a marinade. You'll want to let this sit for a good day, or at least overnight. Traditional marinades for lamb start with olive oil and end up with a seasoning of mint, lemon or garlic. We prefer the garlic. Adding mint to lamb is in our opinion just a way to cover the strong flavor of older cuts. When grilling, make sure the surface of the meat has a good coating of oil. Lamb will stick more than some other meats. When smoking or barbecuing, give it a good marinade and stuffing. With large cuts of lamb, make incisions into the meat and add whole garlic cloves. Sprinkle with parsley, thyme, rosemary, basil, bay leaves, etc. If you do it right the neighbors will throw out their grills and move into your backyard (charge rent). Remember that lamb has a strong flavor. Don't hide it; complement it. Garlic, olive oil, wine, basil, thyme, rosemary, pepper, dry mustard, curry powder add to the flavor of lamb. Don't skimp on the flavor. 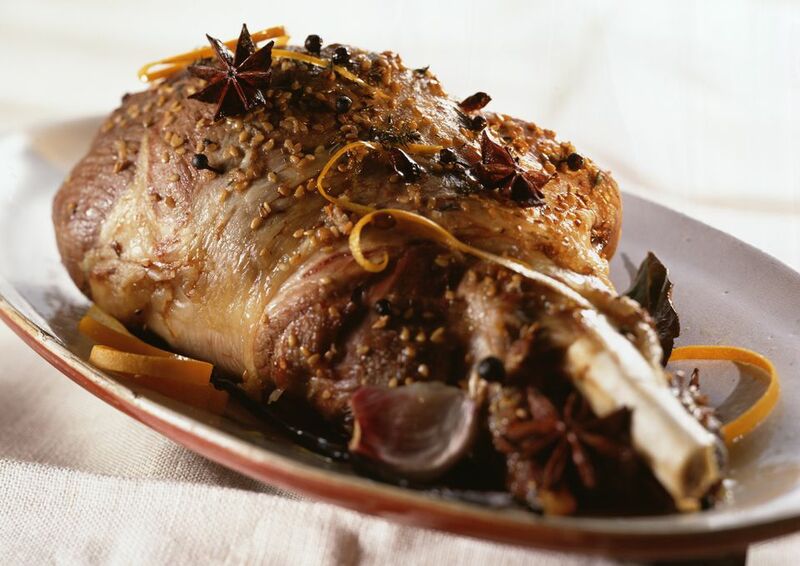 Lamb is a primary meat from some of the world's best cooking traditions (Greek, Italian, and Indian).